I am by know means a great crafter, in fact, it’s my weakest area, but I’m always up for an easy DIY Craft especially when it’s for St. Patrick’s Day. 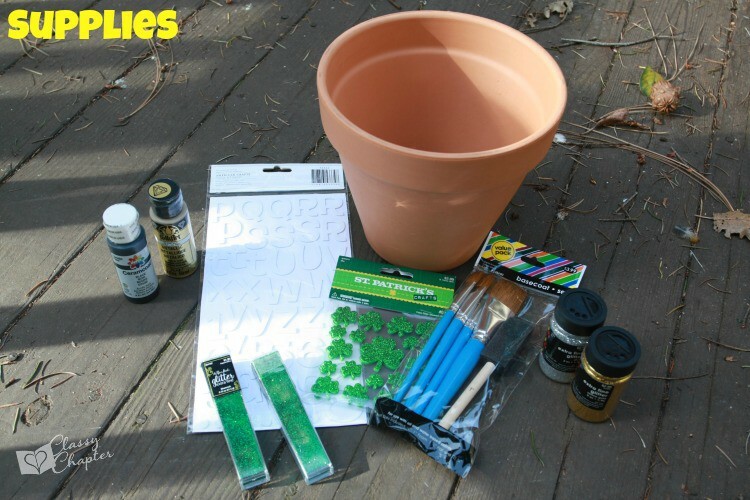 This St. Patrick’s Day Craft Ideas is super easy and fun to make! I had some empty terra cotta pots laying around and figured it would make the perfect “pot of gold”. Not only was this such an easy craft to make but it was a lot of fun. My six-year-old daughter had a blast helping me. To make your own pot of gold, you’ll only need a handful of supplies. All of the supplies listed below can be found at Michaels, Hobby Lobby or on Amazon. 1. Start off by painting the lip of your pot with the gold paint. You might want to use a smaller brush here so you can edge it out. Let the gold dry for a couple of hours and then paint the rest of the pot black and let dry. 2. Once the paint is dry you’ll take your double-sided lettered stickers and dip them in glitter. I alternated between green, silver and gold glitter. Get creative! Stick the letters on the pot making sure to press hard so that they stick to the outside of the pot. 3. 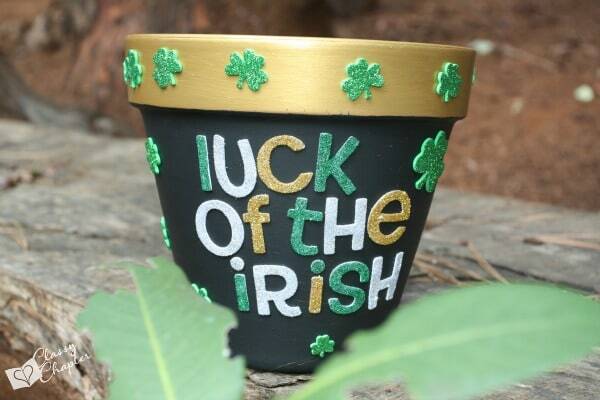 Decorate your pot with Shamrock stickers and you’re done! 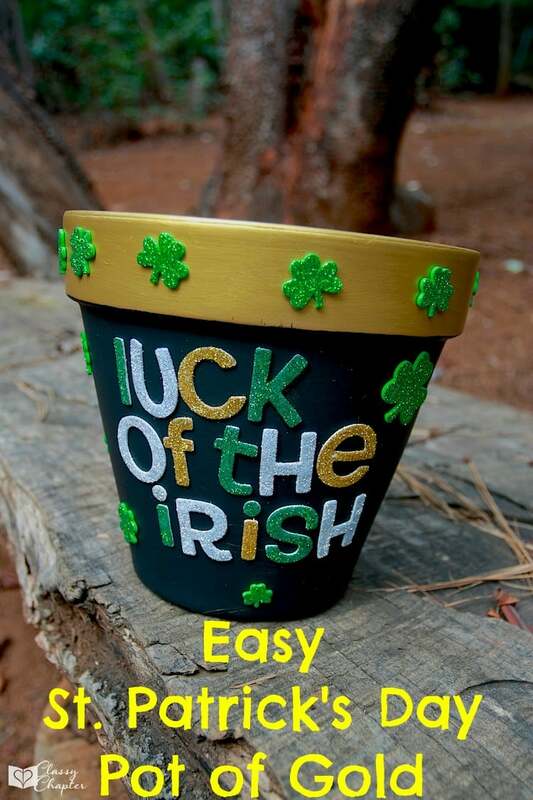 You can use this pot to place on your porch with flowers, on your table with candy in it or as a centerpiece for a St. Patrick’s Day party! Stay tuned as I will be showing you how to take this easy St. Patrick’s Day craft and turn it into a centerpiece next week. 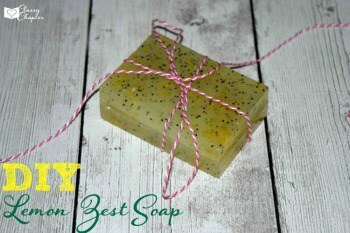 If you enjoyed this craft make sure to check out my tutorial on DIY Lemon Zest Soap Bars below! Make sure to follow me on Pinterest for more fun crafts! It was a lot of fun! Next week I’m adding cookies to it to make a display.